Moonlight Champa offers flashpackers clean, comfy rooms and personable service. Ad Book now! Rates from US$24.8++. Average rating 8.4 from 365 reviews. Though rooms are tiny, they’ve used clever tricks to maximise every inch of space and to make it feel larger: bright white walls, white linens and white floors, good lighting, beds without headboards and a small desk that folds down from the wall. It certainly is minimal but somehow feels contemporary rather than cheap and spartan. The attached wet-room style hot water bathrooms are also tiny and modern; larger people may have trouble with the size. The deluxe double room gets more space in the form of a private balcony with table and chairs. If you need to stretch out, you can also hang out in their boldly blue lobby – there is no shortage of chairs there. Formerly Soukxana Guesthouse, it was revamped head to toe in 2013 so everything still feels fresh. The very friendly owner puts in real effort to make guests feel welcome. A signboard in front cheerfully welcomes each arriving guest by name – a nice touch after a long bus ride – and on the back it wishes those leaving good luck. Breakfast is not included but tea, coffee, bagels and drinking water are free in their small kitchenette. They are also helpful with booking tickets and making other arrangements. A great guesthouse if you don’t mind small spaces or the ten-minute walk from the city centre. 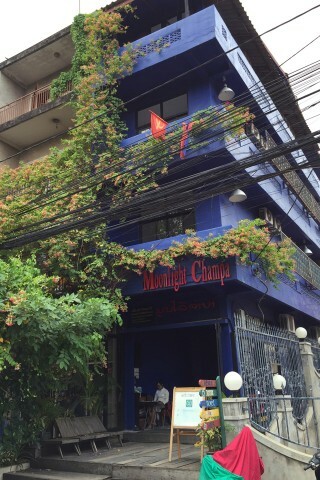 Check rates at Moonlight Champa on Booking.com.